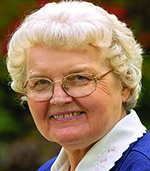 Sister Constance Lovcik (Sister Constanza Marion), age 92, died at the Marie-Rose Center at Mary’s Woods in Lake Oswego on May 28, 2017. She was a vowed member of the Sisters of the Holy Names for 72 years. The daughter of Albin and Barbara Bina Lovcik, Sister Constance grew up in Salem, attending Sacred Heart Academy in grade and high school. It was a devout Catholic home, where the family prayed together, dedicated themselves to the daily rosary, and observed the traditional Lenten practices — “no candy or movies during Lent” — and stayed in close contact as long as they lived. Even after Connie entered the Holy Names novitiate in 1943 as soon as it was permitted, they called, wrote and visited on a frequent and regular basis. The Lovcik family was a musical one, and Connie sang and played the violin in school and kept her love of music for the rest of her life, using this background to study and teach music, principally strings but also piano and organ. Her music ministry took her initially to Sacred Heart and St. Aloysius schools in Spokane, St. Anne’s in Seattle, and then to Portland where she taught at St. Ignatius, Holy Redeemer, St. Clare’s and St. Mary’s Academy. In every place she specialized in violin instruction and in most formed orchestras. Sister Constance loved to study. On a trip to Europe with a musical group, she not only enjoyed the musical experiences, but also relished the cultural and historical opportunities provided. She had an inquiring mind and thirst for knowledge, which made her a wonderful conversationalist. Sister Constance is survived by her sister, Virginia Moran, brothers, David and Thomas, nieces and nephews, and the members of her religious community. Remembrances may be made to Sisters of the Holy Names, P.O. Box 398, Marylhurst, OR 97036 or online at www.snjmusontario.org/donate.